A Tale of Two (or three or four) Diets! I have said for years that I don’t believe in diets. I mainly say this to people who are doing diets which I personally think of as ludicrous, Slimfast springs to mind. It is of course a load of old tosh as I have actually been on every diet under the sun – cabbage soup diet, low GI diet, detox, weight watchers, the Sonoma diet and the 5:2 diet – to name but a few. Blame the parents! Both of my parents have been on a diet for as long as I can remember. Their stock phrase however (whilst tucking into a quarter of sweets in front of Family Fortunes) was “I’ll start again on Monday”. To be fair to them they were consistent in the diet they abused – Scottish Slimmers – and this diet did transform my mum from waistless wonder to the beautiful trim lady she is today. I am not overweight but I could be very easily and the scales often tip beyond my happy place. My problems with food are as follows: firstly I love indulgent, rich food – cheese, cream, chocolate, cakes, wine. Secondly and somewhat more damaging is the lack of control I have when faced with such delights. I would think nothing of demolishing an entire tray bake, wouldn’t even feel sick! I have no concept of moderation when it comes to lovely nosh. So for me diets provide a nice little framework to control my gluttony. I recently stopped the 5:2 diet which I now decry as ludicrous of course. Any diet which tells me I can eat what I want on non fast days is going to spell disaster. I spent the fast days being grumpy and cheating on tiny crumbs of chocolate and the feast days quite literally stuffing my face with all manner of lovely junk. The diet claims that once you get into the swing of things you will adapt and your appetite will decrease – HA ! From 5:2 I lurched onto controlling my calories to a silly piddly 1200 per day. It’s not a lot folks! This was pointed out in a rather forthright but loving manner by a good friend who was appalled that I planned to miss lunch after indulging in a piece of chocolate tiffin. She also likes her food but seems to have been losing weight steadily over the last 6 months or so. Her tool has been Slimming World and she urged me to give it a go. What the hell! Another day another diet. I have been on this one for about 3 or 4 weeks and so far so good. 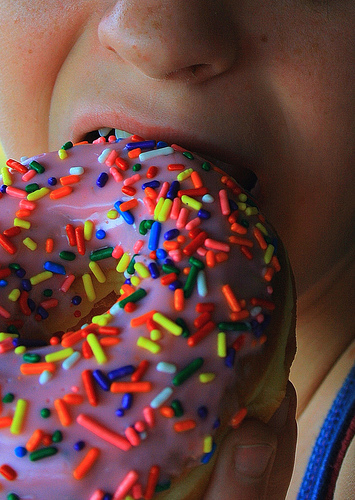 You can actually eat ALOT, although what you can eat a lot of does not equate to indulgence. Wine has been slashed and cakes are non-existent but I can’t say that I am hungry. You can also have a Chinese takeaway on this wonder diet but just steer clear of the spring rolls and prawn crackers! I like it, it’s just healthy eating. It just gives me that framework to stop me going nuts (most of the time). However like all diets, high days and holidays are impossible, I have opted to gaily abandon the diet on these occasions and indulge to my heart’s content. Makes life much more pleasant. However my insides do not agree with my method. On Sunday we were round at the PTs for lunch and they had gone to town with a food fest which would melt any dieters resolve. To start there was fried black pudding served with caramelised apples and green leaves, next up was the most adorably fragrant and tender Beef Bourguignon served with lusciously creamy dauphenoise and a daub of golden puff pastry. 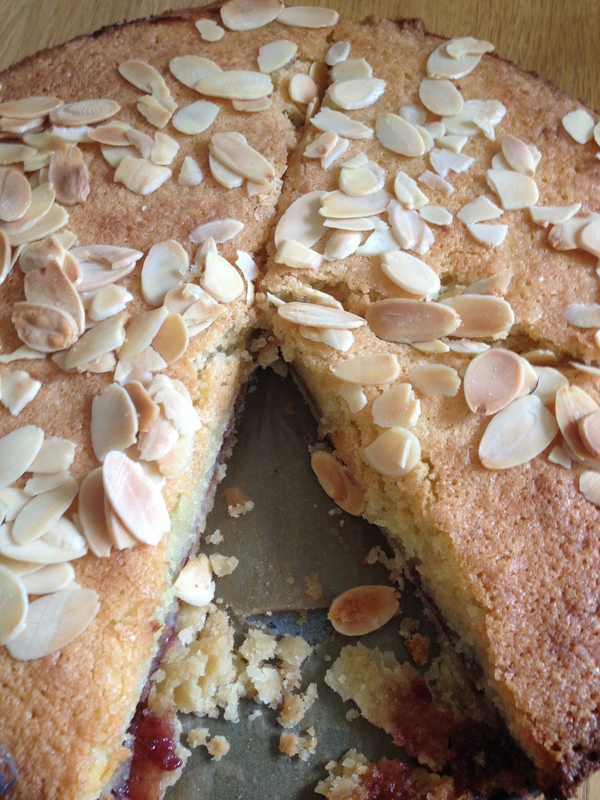 We then partook in Cat’s home-made Bakewell tart with fresh berries and cream. She is an avid Bake Off fan and I believe would give this years contestants a run for their money, hell she would give Mary Berry a run for her money. We didn’t stop there however – there was still little biscuits, grapes and a selection of Spanish cheeses and quince to get through. it was glorious and all washed down with several glasses of the red stuff. However it appears that my diet has ruined me! My gloriously tasty meal decided it was happy at the top of my stomach and decided to stay there for the rest of the day and most of the night. I felt like I had consumed three Christmas dinners. And so it was at 10pm that I slunk to bed with nothing for supper but two chewy gaviscon. It is a sad state of affairs when a dye in the wool foodie can’t indulge without such dire consequences. I feel that there ought to be a moral to this story, but there isn’t. It’s simply a rambling tale of one girl, many diets and lots of lovely food. I would be really interested to hear your diet tales. What works for you? Have you found the holy grail – the diet that allows wine and cake? Categories: MUSINGS | Tags: scales | Permalink. Fresh from our trip to Northumberland and desperate to maintain a holiday vibe we had taken a trip to Dunkeld to introduce the wee one to Peter Rabbit and friends. The Beatrix Potter Exhibition & Garden in Birnam tells the story Miss Potter and offers a fully interactive experience for children. We visited Mrs Tiggy Winkle in her house, saw Jeremy fishing and Ns favourite – the Gentleman Fox. To be honest food was the last thing on my mind. Following our Northumberland curry quest (more on that at a later date) I felt like a foie gras duck and the scales were backing me up. however B had been on Trip Advisor and had sourced a tea room nearby that got cracking reviews and never one to let a new foodie find slip through my fingers, I agreed that we should seek it out for lunch. 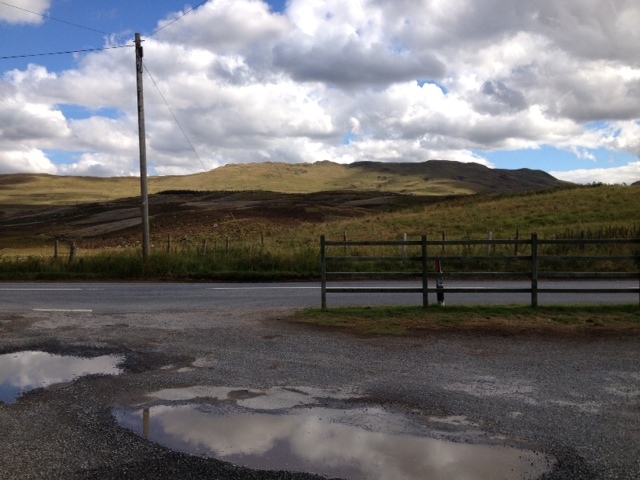 We drove out of Dunkeld into the hills and after about ten miles we reached the middle of nowhere – the Amulree . This charming little whitewashed cafe, complete with bunting floating in the breeze, was surprisingly busy considering the location. I had that tinkly feeling that told me it was going to be good. 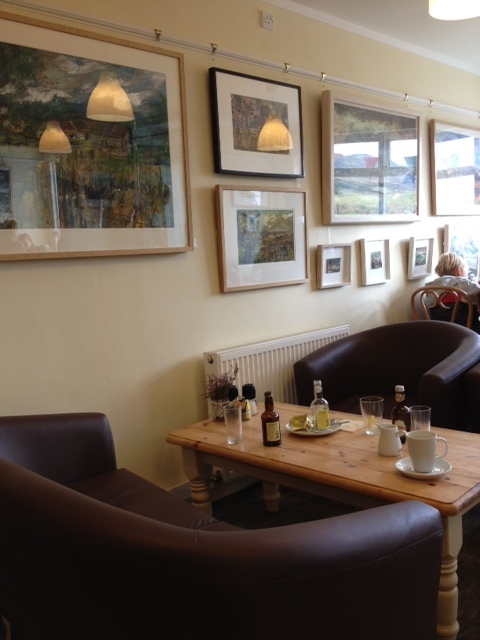 The interior was spotless, tasteful and modern with local art (for sale) adorning every wall. There were about five tables for customers and a little area with toys to keep children amused. 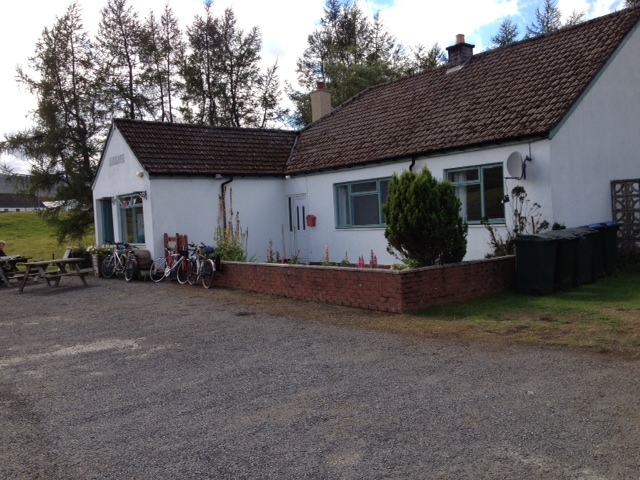 The menu was very small – soup, paninis and home-made cakes. It may be small but let me assure you that it was absolutely perfectly formed. We both chose the home-made mushroom soup. This could be served with either soda bread, rice cakes or oatcake. 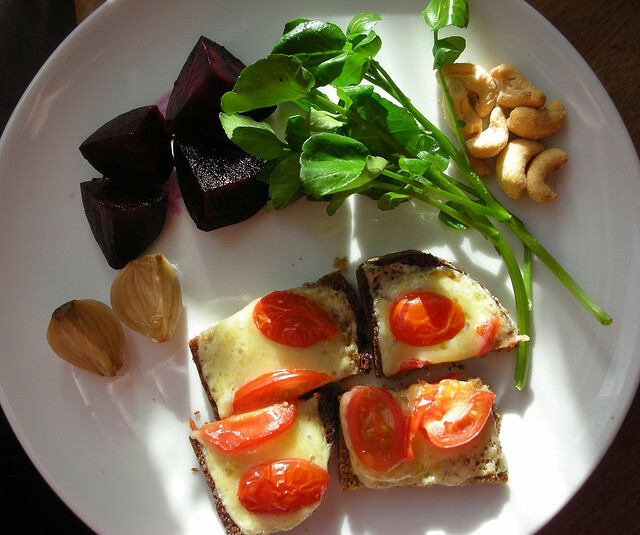 I opted for soda bread – good choice! 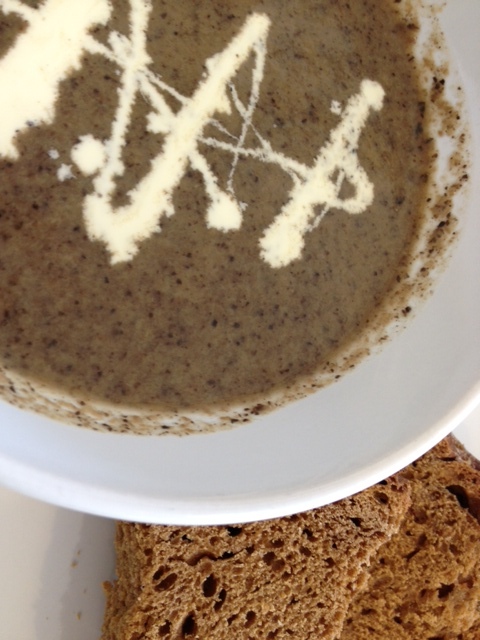 The beautifully “meaty” mushroom soup was beautifully flavoured and laced with cream. Comfort in a bowl – all was right with the world. The soda bread was unlike any soda bread I have ever tasted before (in a good way). It was light with a lovely sweetness which loved lashings of salty butter. It should have been enough but there was a cabinet of cakes that could not be ignored. B proclaiming his body a “template” did abstain – how disturbingly unusual! 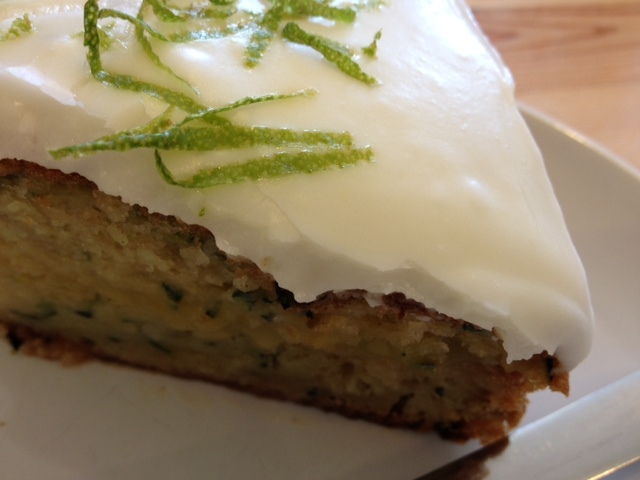 I justified my cake consumption by announcing that I was actually having two of my five a day in choosing a moist and delicious looking frosted courgette and lemon cake – don’t judge me! This cake was to die for – so moist with such a beautiful lemony tang balancing the sweetness. I am always surprised at how delicious cakes using vegetables are – a bit like the famous Peter Kay sketch – Garlic …. and Bread. Courgette …. and cake!!! But delicious it was.